Donnie Yen in The Monkey King. The Skinny: A likely disappointment for those tuning in for Soi Cheang and Donnie Yen, but a passably entertaining spectacle for kids and families. Despite being modified from the classic legend, the story adaptation works and the Monkey King is given a solid character arc. Donnie Yen is engaging as a more innocent and less arrogant version of the Monkey King. Costing a pretty penny and delayed multiple times, Soi Cheang’s The Monkey King broke box office records upon its eventual release – in ticket price-gouging 3D – during the 2014 Lunar New Year. The expensive Donnie Yen-starrer also earned middling-to-poor notices from Chinese and Western pundits alike, and yet the box office train kept rolling. So what gives? Should we enjoy this movie like the four-quadrant blockbuster that it apparently is? Or dislike it for its inaccurate adaptation and lack of geek-baiting coolness? Actually, both perspectives have a point. While the film lacks edge or creativity, and departs from Monkey King lore in a very important way, it still holds together as an OK fantasy film for families and kids. More inspired Monkey King films like Stephen Chow’s Journey to the West: Conquering the Demons present a stronger alternative, but The Monkey King is fine for standard commercial entertainment. Just don’t go in asking for too much because this movie won’t give it to you. Taking it further, The Monkey King will absolutely disappoint if you see the names Donnie Yen and Soi Cheang and think Ip Man or Motorway. Neither Yen nor Soi brings the grit or cool that fans of those films expect – though both do get paychecks and parental points as compensation. The screenplay loosely adapts the earliest chapters of the epic novel “Journey to the West”, while doing little to make the fanciful story accessible to uninitiated audiences. A battle between deities led by the Jade Emperor (a charismatic and regal Chow Yun-Fat), and demons led by the Buffalo Demon King (a dour and intense Aaron Kwok) leaves the Heavens in ruins. Defeated, the Buffalo Demon King is banished to the Flaming Mountain alongside his heavenly lover Princess Iron Fan (Joe Chen). Meanwhile, the goddess Nuwa (Zhang Zilin) surveys the wreckage then writhes about like she’s in an expensive shampoo commercial before turning into a zillion blue crystals that repair the Heavens. The blue crystals also give birth to a monkey (Donnie Yen) who’s later named Sun Wukong by the benevolent Master Puti (Hai Yitian). A disciple of Buddha, Puti believes enough in Wukong that he gives him clothing and trains him in Taoist techniques. However, the Monkey’s mischief gets him sent back to Mt. Huaguo, where he can play king of the monkeys and not annoy humans. Wukong’s playfulness causes more trouble when he acquires his iconic golden cudgel by stealing it from the East Sea Dragon King (Liu Hua). Feeling his oats, Wukong arrogantly titles himself the “Great Sage Equal to Heaven” and heads skyward to meet the Jade Emperor, who, amused at the boastful monkey, assigns him to guard the Heavenly Stables. But more mischief follows; the Monkey raids the Celestial Peach Orchard before attempting to steal of one of the Jade Emperor’s power-enhancing elixir pills. Tempers flare, the gauntlet is thrown and soon Wukong causes havoc in Heaven. Wukong’s anger at Heaven would be the cause of his rampage if this were a faithful adaptation of “Journey to the West”. However, the screenplay makes the Monkey a patsy for the Buffalo Demon King and the traitorous god Erlangshen (Peter Ho), who wish to use Wukong’s connection to Nuwa’s blue crystals to undo her protection of Heaven and clear the way for an assault by demon armies. Basically, Buffalo Demon King plays both Sun Wukong and the Jade Emperor, which in many ways changes the point of the story. The changes spare Wukong from being the villain – which he essentially was in the original text – and also give him a chance at redemption during the film, as opposed to 500 years later when he’ll be drafted by the monk Xuanzhang for their journey to the west. Narrative efficiency for a one-off film, hedging the bets on a sequel – it’s understandable why filmmakers would make this choice. The downside is that Sun Wukong has been neutered. The Monkey is now a gentler, less dangerous character lacking the rebellious edge given to him in other screen adaptations. Also, giving the Monkey a chance for instant redemption makes his punishment unnecessary. Following his rampage, Wukong was imprisoned beneath a mountain for 500 years so that he could learn humility, with his assignment to Xuanzhang meant to redeem him. But since Wukong isn’t really at fault for his actions, why does he need redemption? The Powers That Be have already announced a sequel with Donnie Yen returning and Louis Koo joining him as the most tanned Xuanzhang ever (an unseen Koo provides Cantonese voiceover for Xuanzhang in The Monkey King). But Yen’s tamed Wukong won’t need a leash, much less the restrictive golden headband used by Xuanzhang to control the Monkey’s primal urges. 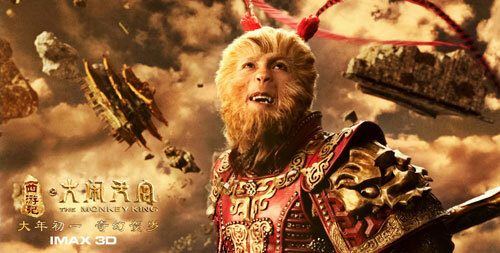 Obviously, the filmmakers will find a way to tell their story, but this is a different Monkey King than expected. To his credit, Donnie Yen plays this version of the Monkey King well. Virtually unrecognizable beneath makeup, Yen jumps around gamely and mugs up a storm, and is genuinely engaging as an innocent Sun Wukong whose naughtiness is more childlike than cunning. He’s a great hero for a kids film, which The Monkey King plainly is, as evidenced by the colorful set designs and run-of-the-mill CGI. There’s also the anthropomorphic costuming, which looks like it belongs in a monkey-led spinoff of Cats. These garish details are fine for family fantasy, though the obvious fakery may turn off older moviegoers. Technically, the film is unimpressive, with lackluster cinematography and action design, plus CGI that sometimes looks blurred or incomplete. The Monkey King’s production seems to resemble that of a Disney stage musical – a production with visual splendor but also obvious flaws owing to practical or technical limitations. Running time is bloated and the lack of narrative development makes the story seem aimless, but children will likely not care due to the fantasy settings and Donnie Yen’s energetic performance. The variety of anthropomorphic creatures is also a boon for the kids. Besides the monkeys there’s a pretty fox maiden named Ruxue (Xia Zitong) who serves as the love interest, and her entourage is a band of creatures that includes a fat panda (or rather, a guy in a fat panda suit). One of the monkeys even has a big nose that makes him look like a simian Soupy Sales. These are superficial details pandering to kids, but the emotional throughline is still solid, with Sun Wukong getting a character arc suitable for a hero’s journey. A few darker moments add pathos, though some imagery may be upsetting to tykes. Mass graves can do that. Notes:  This review is based on the 3D version of the film.